If you're on the lookout for a casual yet absolutely chic outfit, opt for a dark brown shearling jacket and blue flare jeans. Both items are totally comfy and will look fabulous paired together. 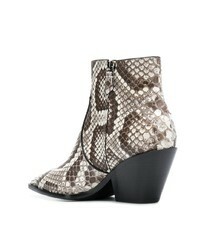 A pair of Casadei cuban heel ankle boots from farfetch.com adds some real flair to this ensemble. If you're after a casual yet totally stylish ensemble, consider wearing a brown shearling jacket and blue jeans. Both pieces are totally comfy and will look fabulous paired together. You could perhaps get a little creative in the footwear department and elevate your getup with Casadei cuban heel ankle boots. If you're on a mission for a casual yet totally chic outfit, consider teaming a white coat with blue ripped skinny jeans. Both garments are totally comfy and will look fabulous paired together. You could perhaps get a little creative in the shoe department and elevate your ensemble with Casadei cuban heel ankle boots. 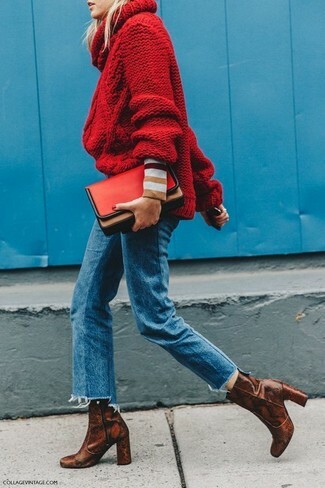 If you're on the lookout for a casual yet absolutely chic outfit, consider teaming a red knit turtleneck with blue jeans. Both garments are totally comfy and will look fabulous together. 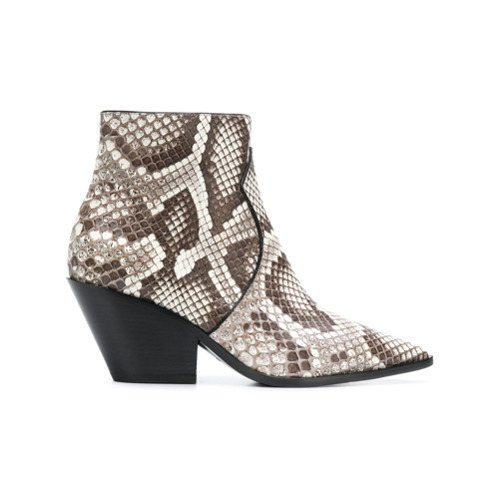 Rock a pair of Casadei cuban heel ankle boots to take things up a notch. Dress in a grey sweater dress for a refined yet off-duty ensemble. 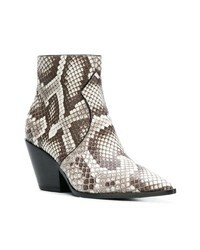 Casadei cuban heel ankle boots work spectacularly well within this getup. If you're searching for a casual yet chic outfit, try pairing a black fringe leather open jacket with a tan button skirt. Both garments are totally comfy and will look fabulous together. Rocking a pair of Casadei cuban heel ankle boots is an easy way to add extra flair to your outfit. If you're scouting for a casual yet chic ensemble, opt for a blue denim shirt and a white pleated mini skirt. Both items are totally comfy and will look fabulous paired together. 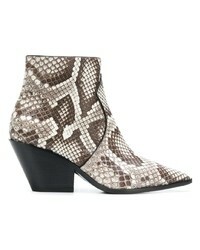 Make Casadei cuban heel ankle boots your footwear choice to kick things up to the next level.